The local comedy scene is thriving in Central Oregon. Local cultivators of comedy have taken on the task of curating solid offerings, showcasing not only local talent, but heavy hitters touring the stand-up comedy circuit also. In the past five years, comedy show producers such as Ipockolyptic Productions, Beertown Comedy and Central Oregon Comedy Scene have cropped up. Bend Comedy, while one of the older comedy clubs in Central Oregon, was only recently founded, in 2012. When considering improv comedy as well, the list gets even longer for the local scene. If you're looking for a good laugh — or even some stage time of your own — it's not hard to find on any given week in Bend. Here are a handful of local funny people you should know about. While Central Oregon has more than its fair share of hilarious up-and-coming comedians, there aren't too many working comedians calling Bend home. Cody Parr, one of the few to hold the title, has a few film credits to his name from his time in Los Angeles. After writing a script for a series called "Beertown," a show based on Parr's time in the beer industry, Beertown Comedy became sort of a digital brand for the local comedians seeking exposure in Central Oregon. Cody Parr on stage at The Capitol. "We live in an area that's fairly isolated, so I wanted to create a way for myself and others to get our names out there, faster, to the rest of the world," says Parr. As for where he gets his sense of humor, he credits his dad, uncles and grandfather. Parr says comedy is a form of therapy for him, and others, that has carried him through some of the hardest moments in his life. "I think comedy, like music, is a very powerful art form. To make somebody laugh and elevate any stresses they may have by filtering your own through a comedic lens is incredible," says Parr. "To make an entire room come together and do that same thing at the same time is beyond incredible." Three years ago, Katy Ipock took to the comedy stage for the first time at the (now defunct) Summit Saloon on a night out with her husband. She loved it and has said "yes" to every local show that she's encountered since. Fast forward a few years later and she owns her own production company, Ipockolyptic Productions, producing a monthly comedy showcase for local comedians, as well as regular open mics at Craft Kitchen & Brewery. Katy Ipock performs at the Galentine's Day Comedy Showcase at Craft Kitchen & Brewery. When I asked her why comedy — and why now — Ipock says she's always enjoyed the spotlight. "Public speaking isn't something everyone can do. I do not have a clean enough mouth to be a politician. My public speaking days are kind of done," says Ipock. As for what she looks for in a comic when she's booking showcases, she says it's a little different for every booker. "For me, when I am watching open mics for the basic stuff: are they holding the mic right, is their stage presence engaging — that basic stuff — and then writing's important. Are they performing in a way that is funny?" Sure, it sounds basic. Easier said than done, right? The availability of stage time is part of the reason Bend's local comedy scene is burgeoning — something comics in larger areas like Portland or Seattle have to fight harder to get. "We're starting to get interest from comics out of town wanting to perform. Interest from big talent that see Bend as a place that cultivates new talent that could be ready for roadwork." says Ipock. 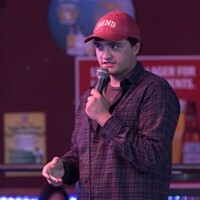 Favorite Local Comic: Cole Robison – "Best new comic of 2018"
If you think a crowd at an open mic is a hard nut to crack, try making another comedian give up a whole-hearted laugh. Robeson's name came up multiple times in conversations with local comedians — so you could say he's the comedian's comedian. Cole Robeson, the comedian's comedian. I met Robeson outside of Seven Nightclub for a quick interview before an open mic performance in December. It was 20-something degrees and the door man was late — or, as it turned out, the show was canceled, unbeknownst to the handful of people waiting for Godot outside the club. Robeson was good company, though, and was easygoing despite the cold. Robeson started performing stand-up in January of last year, hitting as many open mics as he could in his first few months to hone his material. His style: a lot of one-liners with play on words, a-la Mitch Hedberg with the wry, droll candor of Norm McDonald. Robeson says his goal is to make the people in bars listen—especially the ones who aren't there to see the show. If he can do that, he knows he's got something good. He says there are plenty of opportunities in Central Oregon to sharpen his set. In a Source story on comedy in January, Robeson said he'd advise that people move to this area to "get good" before tackling the scenes in places such as Portland. While Ipockolyptic Productions is curating up-and-coming local talent, Bend Comedy is bringing in the main headliners from the Pacific Northwest and beyond. Elaine Johnson joined forces with Bend Comedy co-founder Ryan Traughber a few years ago after performing at her first open mic, helping to book talent and promote shows. Elaine Johnson, comedy host extraordinaire, at Craft Kitchen and Brewery. "The first time I did open mic was my 35th birthday and it was a bucket list thing," says Johnson. "My birthday is September 11, and so over the years I've collected these stories of people's weird reactions to learning that that's my birthday. It just kind of turned into, you should probably say this stuff on stage because it's kind of funny." Bend Comedy brings in a lot of regional talent, but they also hold a weekly open-format open mic at Seven Nightclub that draws in new comedians. When I asked her if there is a lot of crossover between the improv and stand-up comics, she laughs and says that those who are comfortable doing both are a rare breed. "Improv terrifies me because it's not written down. I can't prep for it and I have to rely on other people — I have to trust these other four or five people to have my back," says Johnson. "Whereas stand-up, you're like a lone wolf, right? You get to sit in your cave and just write everything down that's in your brain and figure it out and hone it and then do it." Favorite Local Comic: Dana Buckendahl — and a shout out to Bend Improv Group.